We have bugs! Which is not necessarily a bad thing. There are good bugs and bad bugs. We typically want both in our gardens. If your garden doesn't have bad bugs, the good bugs cannot survive. Beneficial insects is natures way of killing insect pests. Here is a picture of some aphids munching on one of my Dortmund climbers. (Look at those two little greenish critters on the red leaf on the left side of the picture.) But look at that ladybug working her way towards them. Watching her, I see she moves very quickly in apparent random directions. But when she finds an aphid, it stops her in her tracks as she enjoys the feast. They can eat 50 to 60 aphids per day. We release Ladybugs throughout the year. Once or twice in the Spring and once in Fall. One package of 1,000 adults will produce more than 10,000 pest-eating larvae in your garden within 30 days. Ladybugs in your garden is a sign of a general well being in the insect complex. Will they fly away when you release them? Yes, some will. If you don't have any bad bugs for them to eat, they all will. Otherwise, some will stay and reproduce. The intent of releasing beneficial insects in your garden is not for those to populate your garden, but to "seed" your garden. With a healthy and diverse plant environment, free of chemical insecticides, you will see the good bugs taking control in pretty short order. Ladybugs are usually most successful at aphid control, but also eat mites, scales, mealybugs and a whole host of other soft-bodied insects. If I had to choose a single beneficial insect for my garden, it would be this one. Hands down. No question about it. What are they? Nematodes are one of the most abundant groups of living creatures in the world, with species ranging from pests of plants and animals to beneficial species like this one. This microscopic creature can survive in oxygen rich water or in the root zone of your plants. They will not harm plants, animals, humans or even earthworms. Many other insects that spend part of their life cycle in the root zone can also be controlled. Nematodes do not kill other types of nematodes. Our breeder has been rearing beneficial nematodes since 1986, and has located a sub-strain we feel is far superior to those available previously. Under ideal conditions, these Nematodes can survive more than 90 days without a host insect. Once one of them locates and enters a host, it will kill the host, reproduce within it and the offspring will exit in search of more host insects; repeating the cycle. Being microscopic, they can't move very far accept when they hitch a ride on a host insect. We recommend applying these once or twice a year. We apply in early Spring and again in the Fall. But if you miss the Spring application, the first application should be now. Get them working in your garden. A $20 package covers most gardens and they continue to work all year. They are so effective, they can work in the soil to kill the immature stages of garden pest before they become adults. Since they kill ticks, fleas, chiggers, Chinch bugs and grubs, many gardeners apply these to their entire yards. These arrive on a sponge. To apply, drop the sponge in water and use a pump sprayer, hose-end sprayer, watering can or pail to disperse throughout your garden beds. This is a new strain of Encarsia parasitic wasps bred with the assistance of the USDA. The main advantage to this new strain, is that it will go after all major strains of Whitefly (Greenhouse / Silverleaf - Sweetpotato / Banded Wing). EF is a tiny, parasitic wasp that will lay 50 - 100 eggs into whitefly larvae. 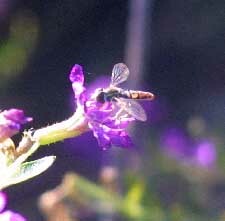 I found this Parasitic Wasp feeding on the bloom of Mexican Heather in late November. This photo is larger than life size. The wasp is actually about 10% the size of a honey bee. Praying mantids are beautiful insects with a voracious appetite for almost any garden pest that they can overcome. Being strictly carnivorous, they'll eat almost any insect of a size they can overcome. Waiting in quiet ambush for hours at a time, when an insect comes wandering by they suddenly jump out and attack - always biting the neck first. At rest, they seem to be "praying", holding their "hands" together. In the fall the females produce egg cases that are attached to twigs, leaves, fences, etc. and may contain 50 to 400 eggs which will hatch into about 200 young mantids on average. 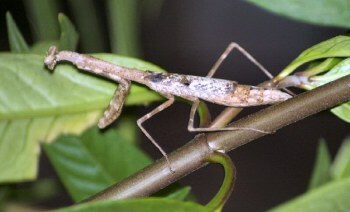 Once hatched, praying mantis begin feeding on small insects, such as aphids. Later on, they'll continue advancing up to larger and larger prey. By summer's end, praying mantis can reach several inches in length. Any egg cases laid before the winter sets in, will hatch when warm weather returns, repeating the process. We hate thrips! 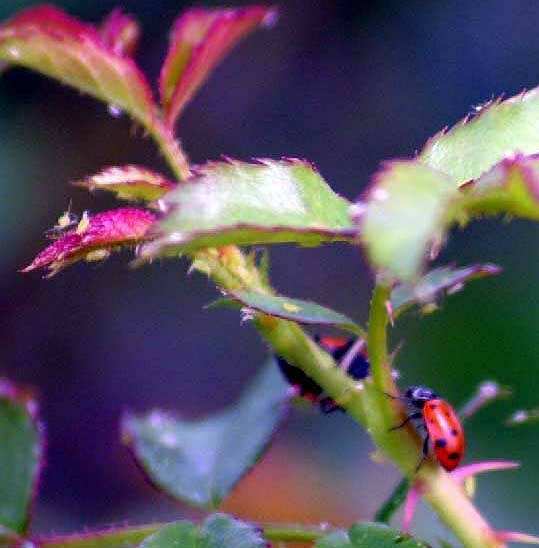 Of all the insects, they do the most damage to our roses blooms. Although they can't kill the bush, they can certainly steal it's beauty be keeping the blooms from opening. Amblyseius cucemeris hunt and kill thrips like no other bug. These come in a small sack of 1,000. They are almost microscopic, but can be seen with a pair of reading glasses. Cut the corner of the sacks and hang them throughout your garden in your bushes. They will fly out and start hunting, allowing you to spend your time on more enjoyable things. Since we are closed, you cannot get bugs from us anymore. And I do not know of a good local source in the Houston area. Ask your independent, organic nursery owner to get them for you. Failing that, you can mail order them from my source our of Colorado, Hydro-Gardens. Due to the heat in Texas, it is best to overnight your shipment. Any living thing will have a tough time in a delivery vehicle for very long. Hydro-gardens ship them in Styrofoam containers with cold packs at no extra charge. Their phone number is 888-693-0578. If you can find a neighbor or another gardener that will order at the same time, the shipping is pretty reasonable. Otherwise, it is more than the cost of the bugs.